Another great mono/stereo remaster. Personally I love the stereo mixes. I know that originally the music was mono, but these new mixes just add some vibrancy to the songs we have known for all these years. I have tried with mono, again and again, but stereo wins for me every time. Just personal taste. I understand those who prefer mono, but I have a weakness for the fullness and the "activity" of stereo. Having said that, the mono recordings are full, balanced and punchy and very enjoyable. So, to the girl who "walks, looks and drives like an ace now..."
Possibly the best of The Beach Boys' "surfing, girls and cars" albums. Up there with "Today!". 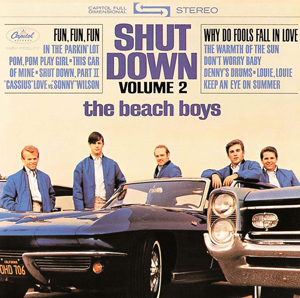 "Shut Down Volume Two" is an enjoyable romp kicked off by Dennis Wilson's girlfriend at the time taking her daddy's car and cruisin' to the hamburger stand (now). Personally I think "Fun, Fun, Fun" is a great little song - funny, and character driven in a way that say "She Loves You" and "I Wanna Hold Your Hand" just are not. I have always been able to visualise the girl in her California sun and she knocks spots off the girl from "She Loves You" who I always imagined waiting in the rain outside the Gaumont in her mac. Up next is the album's undoubted jewel, the peerless "Don't Worry Baby". How old was geeky Brian Wilson when he wrote and sang this? 19? 20? A truly stunning, beautiful song, and the phraseology - wow! That first line "well it's been building up inside of me for oh I don't know how long" gave me shivers down my spine when I first heard it on a hot summer afternoon in 1977 and it still does now. Also wonderful is the third verse - "she told me baby when you race today just take along my love with you..." Sheer poetry and wordsmithery from one so young and awkward. "In The Parkin' Lot" is underrated but the less said about "Cassius" Love Vs "Sonny" Wilson" the better! 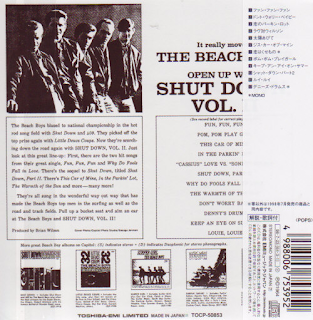 Why did The Beach Boys always have to put some dreadful studio "goofery" on their albums? "The Warmth Of The Sun" is truly beautiful and again, belies Wilson's tender years. "This Car Of Mine" and "Pom Pom Play Girl" are unadulterated FUN and "Why Do Fools Fall In Love" is a more than acceptable cover of the Frankie Lymon And The Teenagers' doo-wop classic. "Keep An Eye On Summer" is lovely and "Shut Down Part Two" a jaunty surf instrumental. "Louie Louie" is not quite as convincing a cover and "Denny's Drums" ends the album not quite as barnstormingly as it began, but that is splitting hairs. Stick this on on a hot summer day, your spirits will be instantly lifted! PS - check out both Ronnie Spector and Billy Joel's covers of "Don't Worry Baby". The former's "Be My Baby" was the inspiration for the track and her version of it is wonderful.